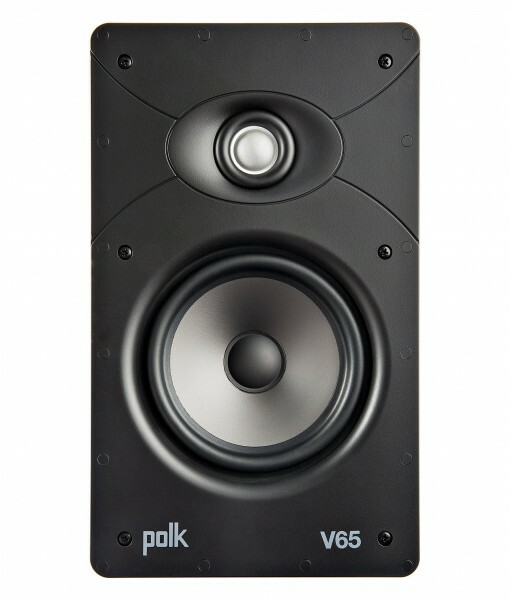 Polk V65 In-Ceiling/In-Wall Custom Install Speakers were created to meet the needs of more modest audio budgets, and the new Polk V65 in-wall/in-ceiling speaker completes the highly popular Vanishing Series. Like other speakers in the series, the new V models have Wafer-thin Sheer-Grilles that are utterly invisible, fit smoothly flush and are acoustically inert for wide dispersion and uniform sound-coverage even in larger rooms. Square grilles also available for In-ceiling 6-1/2 inch and 8-inch models. The V Series also offers the same secure, vibration-free installation with Polk’s patented rotating cam system. Sonically, Dynamic Balance polypropylene cones deliver spectacular midrange clarity, punchy bass and high efficiency, while high-performance silk dome tweeters are built into a swivel mount for direct high frequency control and excellent imaging, even for off-axis listening positions. All Vanishing models share cutout dimensions and accessories and there’s a new slim ceiling model for tight installations.